Judd has provided engines for many major series, including Formula One and other smaller formula series, sports car racing, and touring car racing. They have been associated with manufacturers such as Yamaha, MG, and Honda, although they have mainly been a privateer engine supplier to customers. After the demise of Formula Two at the end of the 1984 season, Judd continued to develop new engines for Honda. The first was the Judd AV, a turbocharged V8 engine built for Honda's CART campaign. It was first used on the CART circuit midway through the 1986 season, fielded by Galles Racing and driver Geoff Brabham. It was initially badged as the Brabham-Honda, and scored a 4th-place finish at the 1986 Michigan 500. In 1987, the engine was used for the first time at the Indianapolis 500. Brabham scored second-place finishes in 1987 at Pocono and Road America, as well as a third at the season finale at Miami. In 1988, Truesports with driver Bobby Rahal took over as the primary team, and the "Honda" name was dropped from the powerplant. During the 1988 season, Rahal took advantage of the engine's reliability in the 500-mile races, finishing 4th at Indy and 2nd at the Michigan 500. He then scored the first and only Indycar victory for the Judd engine at the Pocono 500. His ten top-10 finishes led to an impressive 3rd-place finish in the season points standings. Judd continued to build upgrades to the AV into the early 1990s, even after Honda had stopped badging the engines. When Honda moved into the new Formula 3000 series, Judd again developed the company's engine. Based on the architecture of the AV, the new BV V8 was a naturally aspirated variant, and would eventually form the basis for the Judd CV Formula One engine. After the company's departure from Formula One, Judd returned to Formula 3000 in 1995 with the development of the 3 litre KV V8 engine. Judd built the engines that every Formula 3000 team used, although Zytek was tasked with maintaining the over 80 engines after they were built. Although Judd stopped production of the KV and the Formula 3000 series ended in 2004, Zytek later used the engines as a basis for the A1 Grand Prix units in 2005. During the 1988 season the Judd V8 was commonly the fastest of the non-turbo engines, and the Marches of Ivan Capelli and Maurício Gugelmin regularly recorded higher speeds through the speed trap than the Cosworth DFR and DFZ powered cars with Capelli recording the fastest 'atmo' speed trap of the season when he hit 312 km/h (194 mph) during qualifying for the German Grand Prix at Hockenheim (though this was still considerably slower than the turbo powered McLaren-Honda's which were timed at 333 km/h (207 mph)). At the 1988 Japanese Grand Prix Capelli's Judd powered March 881 became the first naturally aspirated car to lead a lap of a Grand Prix since 1983, when he briefly passed the McLaren of two time World Drivers' Champion Alain Prost for the lead on lap 16 of the 51 lap race. For the 1989 season, Judd developed the all-new narrow-angle Judd EV, with a more compact 76 degree vee angle, rather than the more conventional 90 degrees of the Judd AV/BV/CV, and the Cosworth DFV series. Construction of the CV continued as a cheaper alternative for smaller teams, however. Team Lotus and EuroBrun were the only CV customers, with Lotus finishing sixth in the Constructors' Championship. EuroBrun was originally the only team to continue with the CV unit into 1990, but Life eventually bought CV units to replace their failed in-house design. 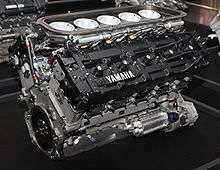 1993 Yamaha OX10A engine, a variant of the Judd GV engine. Following Judd's withdrawal from Formula One in 1992, John Judd turned to Yamaha to continue production of his engines. Using the Judd GV V10 as a base, Yamaha developed an all-new cylinder head and branded the motor as the OX10, for use by Tyrrell Racing in 1993. Once again, Tyrrell were unable to score any points all season. An improved OX10B for 1994 boosted Tyrrell's performance, as the team scored a podium and finished sixth in the constructor's championship. 1997 Yamaha OX11C engine, a variant of the Judd JV engine. An updated C-Spec version of the OX11 was used by Arrows in 1997. Featuring a new bottom end, with changes consisting of a revised sump, crankshaft, oil pump and water pump; the OX11C had an extremely low center of gravity (and a dry weight of 105 kg vs the Renault RS09's 121 kg) but was underpowered (708 bhp vs the RS09's 755 bhp) and most of all unreliable. Consequently, a D-Spec was introduced for the 4th race at Imola, with significant improvements in the airflow management of the combustion chamber area, which permitted the OX11D to gain 20 hp, which along with superior Bridgestone tyres propelled Damon Hill to a second place at the Hungaroring, the 11th race of a year that otherwise was pretty lacklustre with Pedro Diniz's 5th place at the Nürburgring as a last high point before Yamaha consequently pulled the plug on the failing project. After engine involvement with Yamaha in Formula One, Judd returned once again to sports car racing. Believing that a large naturally aspirated engine would be fitting for use as a customer supply in the Sports Racing World Cup, Judd resurrected the GV10 from a few years earlier. Expanded to 4 litres and upgraded with new technology, the new GV4 became a favorite choice for teams not running the dominant Ferrari 333 SP, eventually winning the championship with Racing for Holland in 2002 and 2003. In 2000 a Doran Ferrari 333 SP-Judd hybrid appeared, the performance of the Judd engine being deemed superior to that of the six-year-old Italian unit, which was no longer supported by Ferrari. The GV4s also became powerful enough to contest for overall wins in the 24 Hours of Le Mans, with Oreca Dallaras running the GV4 finishing fifth and sixth in 2002 as well as an overall victory for Doran Lista at the Rolex 24 at Daytona the same year. The engine's reliability record at Le Mans was still patchy and, while it could challenge for pole in Domes and Dallaras, the engine revs had to be reduced to ensure it survived the race. In 2002, Judd introduced a variant of the GV4 known as the GV5. The engine capacity increase to 5.0 litres was an attempt to reduce revs, increase torque, and increase reliability. The GV5 quickly proved its capabilities over the GV4, when it took second place in the teams championship in the Rolex Sports Car Series in its debut year with Doran. Pescarolo Sport later went on to finish fourth at the 2004 24 Hours of Le Mans with a GV5. The following year, Pescarolo finished in second place at Le Mans and won the teams championship in the Le Mans Endurance Series. The engine was further upgraded in 2007, with an increase in displacement to 5.5 litre to produce even more torque while attaining the maximum power at lower rpms and improving fuel consumption. 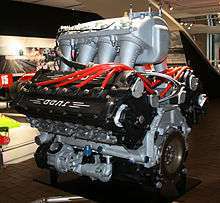 The Judd GV5.5 S2 is currently the most popular customer engine in use in LMP1 class prototypes, especially in Europe. On September 12, 2007, Engine Developments announced their plans for a replacement for the XV675, termed the DB. Although it again retained the 3.4 litre engine capacity, the unit was entirely new. Judd planned to work closely with a top LMP2 team in order to get better testing out of the DB in 2008 before the engine was released to any customers. The engine is now found at the back of the numerous Lola B08/80 LMP2 cars in the LMS championship where it fights for wins against the Zyteks and the rare Porsche RS Spyders. In 1997, Engine Developments was chosen by Nissan Motors to lead their engine development program on the Primera for the British Touring Car Championship. Nissan went on to win the constructor's championship in 1998 and 1999, with Laurent Aïello winning the driver's title in 1999. ↑ "GV5 S2 Runs For The First Time". Engine Developments. 2006-01-24. Retrieved 2006-09-13. ↑ "New Engine for 2007". Engine Developments. 2006-07-13. Archived from the original on September 27, 2007. Retrieved 2006-09-13. ↑ "Engine Developments Introduces New Judd LMP2 Engine". The-Paddock.net. 2007-09-12. Retrieved 2007-09-12.